The newest feature on the Hartford Hawks Women’s Basketball Blog returns for its next installment. The Where Are They Now section will be updated every few weeks with an update from a former member of the Hartford women’s basketball team. Cedric Quackenbush, women’s basketball manager, will catch up with former Hawks and provide an update on their life after basketball. If you have a question or a possible topic for a future Where Are They Now feature, email athletics@hartford.edu. Senior guard Danielle Wexler was the only player on a talented Hawks roster, during the 2005-06 season, that started all 31 games. Wexler, a prolific shooting threat and fierce defender, played a major roll on a championship team that went 27-4 and earned the schools first win in the NCAA tournament. In her final season, she averaged six points and four rebounds per game. During her days as a player Wexler realized she wanted to stay involved with basketball once her career was over. Knowing it wasn’t likely she would play overseas, it dawned on her that coaching would be a great opportunity to stay involved with her favorite sport. 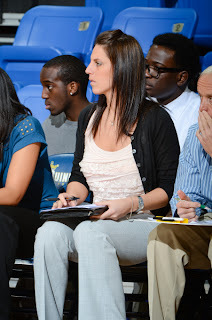 Along with learning from head coach Jennifer Rizzotti on the court, she majored in psychology to learn a mental approach to basketball. After graduating from Hartford in 2006, Wexler became an assistant coach at the University of New Haven, a division two school in Connecticut. Wexler stayed at New Haven for four years and throughout her tenure, the team experienced a lot of success. This past summer, she was given the opportunity move up to Division 1 and become an assistant coach Quinnipiac. This past season, Wexler’s responsibilities included working with the guards in practice, film exchange, practice planning, scouting and recruiting. The team finished 14-16 and had a 11-7 record in the Northeast Conference. Wexler was recently engaged, to fiancé Pierce, and when she’s not in the basketball office, she is busy planning for her wedding this coming August. Once married, she plans on moving to New York to live with her soon to be husband who works there. It may make the commute to work at Quinnipiac a little longer, but it’s worth it because she is very happy to be doing what she loves.